Many organizations today rely on third parties for varying levels of information processing. This is especially true where hosted services provide core applications required for a critical business process. Sharing business process implementation with outside entities may require not only sharing of sensitive information. It may also require reliance on the integrity of financial data derived from vendor systems and imported into an organization’s financial reporting applications. Although there are countless ways to structure such relationships, one factor remains unchanged across them all; the responsibility for protecting sensitive or regulated information rests on the shoulders of the organization which collected it from customers and patients, or protects it on behalf of investors (i.e., intellectual property). The steps necessary to practice due diligence are simple. When followed, they provide reasonable and appropriate protection. 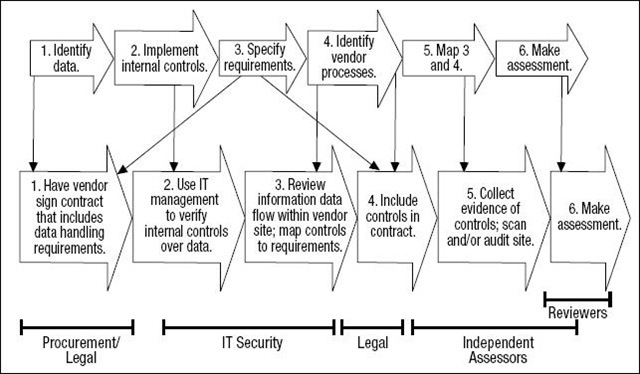 Figure 1, from a recent ISACA Journal article, depicts a simple model built upon six basic activities, extending from before contract signing through the life of the business relationship (Bayuk, 2009). Note the recommended organizational entities involved with each activity. 1. Identify data. There is no reason to provide an entire database to a vendor when a few fields will suffice. Define the process the vendor you expect the vendor to perform and document the minimum data elements required. Include only these elements in any transfer of data. Since your data is already classified (I’m making an assumption here), internal policies dictate how it is to be handled. Use these policies as the basis for contractual wording which compels the vendor to handle shared information in a way you expect. 2. Implement internal controls. Just because you agree not to provide more information than necessary doesn’t mean your staff will comply. First, they have to know what information is allowed to pass. Second, controls must exist to monitor for mistakes. 3. Specify requirements. Requirements include not only what data is exchanged. They also have to specify how the data is protected while its moving between networks or at rest. The requirements should adhere to data classification policies identified in the Identify Data activity. Identify any additional controls and include them in the contract. 4. Identify vendor processes. Up to this point, most of the work revolves around your internal processes and expectations. Now it’s time to see whether the vendor can meet management’s requirements for safe handling of its information. Ask questions about basic security controls in place. Make sure you understand how access is controlled and whether a good disaster recovery plan is in place and tested. Overall, make sure the security framework, including operating processes, will adequately protect your information. Will the vendor be able to meet your requirements? Again, make sure current acceptable controls are included in the contract as well as steps to fill gaps discovered during the process review. 5. Map 3 and 4. At this point, you want to identify any issues which might elevate risk to an uncomfortable level. Verify controls claimed by the vendor actually exist. Then map the results of 3 and 4. Are there any gaps which the vendor is either unwilling or unable to remedy? Report these potential vulnerabilities to management for a risk review. 6. Make assessment. Perform this activity at the point at which the vendor and you contractually agreed that all controls were to be in place. Repeat this assessment periodically during the life of the contract. Assessments should be performed by your internal audit team or by a disinterested third party. Bayuk’s model is simple, and it provides a framework upon which to build a vendor due diligence process which works for your organization.